After a lengthy build process and some fairly extensive faffing around, Saturday night I finally couldn’t put off attempting to start and drive the Tooty Scooty. After dinner a friend and I headed out to the local gas station to get a can of fresh gas. After the requisite amount of synthetic 2-stroke oil, 16:1 for the break-in period, was added, we filled up the tank and wheeled the Tooty Scooty into the driveway for its inaugural run. 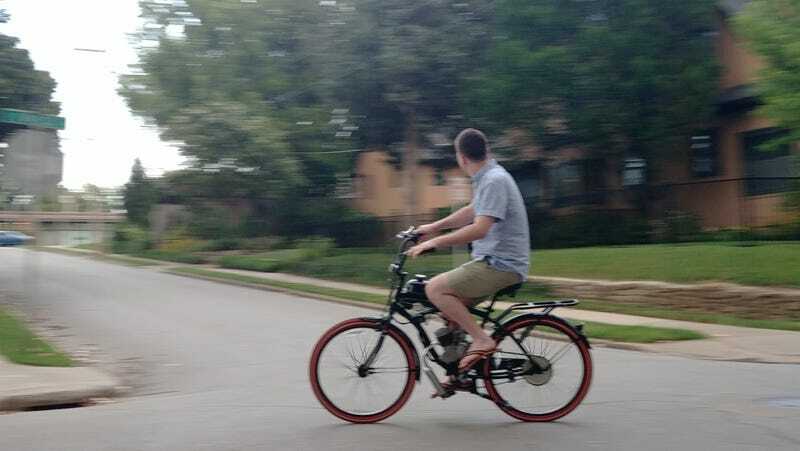 With a 2-stroke motorized bike, there is no kick, electric, or pull start. What you do is pedal up to speed and drop the clutch, which causes the engine to putter into life. In practice what it did was make some funny noises and make it really hard to pedal. I’d heard these thing are pretty hard to get going the first time, but after ten or so unsuccessful runs down the street trying to get this thing give any signs on life, I was tired, sweaty, frustrated, and ready to give up. So, going back to basics, we checked the usual culprits: fuel, air, spark, and compression. Spark being the most straightforward, we pulled the spark plug. It was a little black and smelled of fuel. A good sign. Turning over the engine manually with the plug out produced a sad little spark. Was it enough? I had no way of knowing. On the bright side we were getting some pretty impressive puffs of air out of the spark plug hole, so compression seemed good as well. The spark gap seemed pretty tiny and the users manual didn’t indicate what the correct gap was. A quick google says 0.020, or “pretty tiny”. A feeler gauge confirmed it was pretty close to accurate, so we threw the plug back in and went to check fuel. The only two things we could think to check was flow from the tank, whcih seemed fine, and is the carb was getting fuel. Given the fuel on the plug, I had to assume yes, but backed out the bowl drain to confirm there was fuel there. There was. After drenching everything (the bike, the driveway, us, the dogs, the neighbors, etc) in pre-mix fuel, we figured it was probably getting fuel. We put the bike back on the road and this time it actually coughed into life! It wouldn’t idle, didn’t really like load, and would die at anything under half-throttle, but it was running! Unfortunately we did have some growing pains on the build. Namely my questionable eBay tentioner completely fell apart and the pedals were hitting a screw also on the tensioner. Oh well. At this point it was getting pretty late, so we decided to take the victory and get back to it in the morning. In the interim, I did some pretty extensive googling, discovering a few “first start” tricks and some things to check on these carbs. The main “trick”, apparently, is to hold down the priming button on the carb (the “tickle button” as per the Engrish manual) until fuel runs out of the air intake, then open up the choke and go for it. Also, apparently my symptoms were pretty typical of either an air leak or a problem with the main carb jet. In the morning, the few starting attempts made were very similar to the previous evenings. It would start, but only at pretty significant throttle. Basically it sounded like I had an air leak or the main jet of the carb was either completely disconnected or somehow wonky. Either way, the carb needed to come off. During disassembly I did find one problem. The throttle cable had slipped out of the slotted washer that retains it and become all jammed up. Not sure if this was causing a problem, but it sure was a pain to get put right. Disassembly of the carb revealed no smoking guns, but it did make me further appreciate how dirt simple these things are. Look at that little choke plate!! So very cool. Unlike any car project I’ve ever worked on, re-assembly was fairly straightforward and ended with no extra or missing parts. After performing the questionable “make fuel run out the air hole” trick, I gave starting a go and to my surprise the bike started. Not only that, but with a little manipulation of the idle screw, it also remained running at idle. Since getting it to idle I’ve left it running in 5, 10, and 15 min increments to help gradually break in the engine. I also cleaned up the wiring and further adjusted the (as previously mentioned) woefully inadequate brakes. I took it for a couple mile spin around the neighborhood and it pretty much behaved. George even got to have run, as shown in the first photo. However, on my second run I dropped the clutch and the whole thing slammed to a halt. At first it seemed like the chain had decided to skip. Upon further review it looks like either a (or many) spoke(s) bent or one of the spocket bolts came undone, causing the sprocket to become off-kilter enough to cause the chain to derail. Fun! I’ll get to doing that tomorrow, as the mosquitoes were getting to biting. After that, a few longer test runs? Then start seriously looking at quieting it down and getting some decent brakes on it. The former should be as easy as adding some steel wool to the muffler, but I might wait until I stops puking oil from the overly-rich break in mixture. The latter is going to be a bit more tricky. Apparently you can spend as much money as you want on wheels and I don’t really know enough to pick out the right ones. I think in the interim I am going to try adding some scuffs to the painted rims on my bike to see if that improves braking. Or hit a local bike shop and see what they can do for me. Long term, I wouldn’t swapping the front caliper brake for a cable driven disc brake, but that requires a fair amount of modification and cash, so it’ll be further down the line. Overall I am pretty happy with how everything turned out. The bike looks epic and is already pretty fun to drive. I look forward to taking it further out as confidence increases, and my first group ride once I convince George to buy and build one.